Revive yourself with body massage by senior male therapists at the comfort of your home. 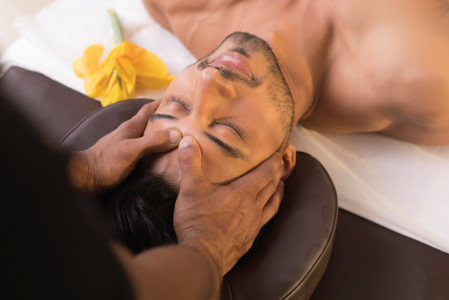 We offer services like deep tissue massage, foot reflexology, swedish massage for men by 4.5 rated male spa therapists with 5 years + experience near you in Bangalore.We provide you with trained & experienced male therapists who are hygiene friendly and will bring all the required supplies for the service. Book full body massage at home now at UrbanClap! Good guy but can be better. He is very professional and good at his work. Very nice person. He knows his job well..
Vijaya is a professional massage men. Our time was allotted for 30 min but he himself took extra 10 min. His foot massage service is really awesome. Superb. He is setting the bar higher. Highly recommended. I think other UC massagers should get trained by this guy. Never expected a good service from urban clap...thanks... therapist Rolan was good and professional.. Excellent service provided by Reman. He is Professional and polite. If you are looking at a therapy to relieve stress we recommend the full body swedish massage. You can either opt for 60 minutes or for 90 minutes. Nowadays it’s hard to find some time to relax our mind and body because of hectic work schedules and busy lifestyles. Hence, we need to take break from the busy lifestyles to pamper our mind as well as our body. One of the best sources of physical relaxation for men is a relaxing massage session. It is what most men need, but can’t get because of a shortage of time. This is why we, at UrbanClap, came up with massage at home services for men – a high quality massage delivered by our skilled professionals at the comfort of your own home. Why do men need a regular massage? It has been found out that even a 30-minute simple head and shoulder massage can calm down your nerves and relax your mind and body. A regular session of massage alleviates all kinds of body pain. Massages like deep tissue massage or Thai massage also helps to manage lower back pain and other aches. If you want to improve the quality of your sleep a light pressure aromatherapy massage is the best for you. If you get it regularly, you will sleep peacefully and your mornings would be fresh and active. Getting a 45-minute Swedish massage helps get rid of disease-causing pathogens by increasing protein levels in the blood. An effective massage on a monthly basis thus improves men’s health. Being a fitness enthusiast is the best gift that you could give yourself. But the downside of exercising is body ache. In that case, you could add massage to your fitness regime. The massage will help your body become more flexible with smooth flow of blood and thus make exercising easier for you. A massage works as a therapy to reduce soreness as well as strain or pull in your muscles and helps you to relax. Besides these reasons, there are other reasons too to get a regular massage. It helps deal with hectic lifestyles and provides men with the much-needed relaxing care. They can feel fresh, relaxed and de-stressed after a good massage session. UrbanClap offers a range of massage services for men at their own homes. You can book for simple head and shoulder massage or full body massage of different kinds through UrbanClap whenever you want. Our therapists usually arrive on time and are fully equipped with all the necessary tools used in the massage. They are highly skilled and experienced. They use superior quality products and maintain hygiene and cleanliness. You get all of this at very affordable prices. You can simply book the massage service for a specific date and time. Once the booking is confirmed, a male therapist will arrive at your place carrying all the required things such as massage kit, full sized portable bed, essential oils, disposable sheets and towels and many other things. You can choose any oil for your massage from a variety of essential oils. You can also use your own bed for massage as our professional will put disposable sheets and towels on it. Let your therapist know about pain and injuries, what areas of body he should concentrate on and which he should avoid. After the massage is done our therapist would clean up the room and dispose of the rubbish to make your room neat again. Swedish full body massage is a good choice for beginners. It’s a light pressure massage where the therapist uses long strokes and simple techniques like kneading, tapping, friction, sliding, vibration and deep circulation movements on different areas of the body. Swedish massage relaxes the entire body and is good for those of you who need pain-relieving massages. Deep tissue massage is the best body massage to get rid of chronic pain. It helps to increase blood flow to the muscles which help in reducing inflammation. In deep tissue full body massage therapists use slow, deliberate strokes that focus pressure on layers of muscles or other tissues deep under your skin. It also helps to treat muscle injuries and scar tissues which hinder free body movements. Reflexologists use pressure points on the feet to relieve symptoms of pain in different areas of the body. Reflexology also helps to pamper your feet through a good foot massage. It also helps in improving blood circulation and relaxes you. After a tiring and stressful day, an effective 50 minute head, neck and shoulder massage is a soothing and relaxing way to relax. The main purpose of neck and shoulder massage is to eliminate tension and stiffness from the muscles. It is a good option for people who spend long hours sitting at desk jobs. Why to avail massage service at home in Bangalore with UrbanClap? We provide expert and trustworthy professional at your door step. We perform background checks and stringent screening on all our professionals before the on-boarding process. All of our professionals are registered with us. They are given proper training in their area of expertise. Here, you don’t have to compromise on your safety while availing any massage services. We assure you to provide the best class therapists for deep tissue full body massage or any other massage at your doorstep. Only experienced and highly skilled professional therapists can provide you excellent health benefits using their exceptional massage techniques. It is essential that the therapist makes you feel comfortable as well as help you achieve the desired results from the massage therapy. The therapists working under UrbanClap have gone through verified background checks and possess 2+ years of experience of working in the best spas. We provide on time service delivery. We ensure that our professional reaches your place at the designated date and time to carry out the massage service as per your convenience and provides you 100% satisfaction on the services rendered. The services delivered by our trained and experienced therapists are done using quality checked products. Our professionals carry all the essential things like aromatherapy oils, disposable sheets and towels, a full size portable bed, scented candles and play soothing music to transform your place into a blissful space where you can relax. We guarantee a clean, neat and hygienic home massage experience, by our trained male therapists. Our male therapists bring single use disposable sheets and towels for massage. They also clean and tidy the work place before leaving your homes.